In the name of full transparency, please be aware that this post may contain affiliate links and any purchases made through such links will result in a small commission for me (at no extra cost to you). Thanks for your support! After I made these pastries, first I did a little happy dance and then I promptly gave 8 of them away. I wanted to see what my friends thought of my little creations, and to get them out of my house before I was tempted to devour them all! Their first reaction was “Did you really make these”? My texts lit up, once my friends had the chance to give them a try, singing the praises of these beautiful little delicacies. The puff pastry was flaky and while beautifully delicate, was strong enough to hold the gooey apple filling. 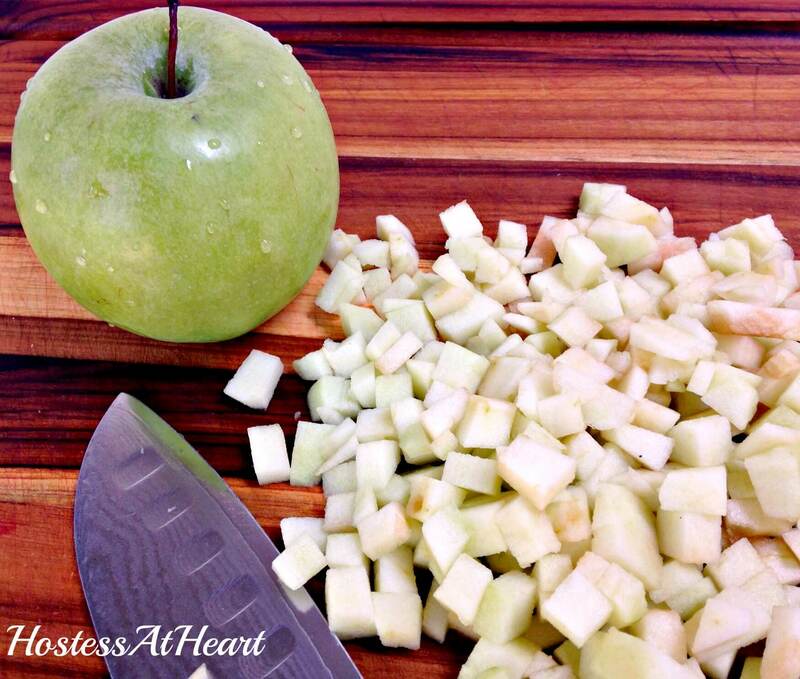 My inspiration was these granny smith apples sitting on my counter. They just kept staring at me, whispering that they would soon be self-destructing if I didn’t do something with them soon. Seeking inspiration, I started cruising through Pinterest. You know that site that pulls you in and then steals at least two hours from your day? Well, not today, I was on a mission. I had it in my head that I wanted to make individual apple hand pies. That is until I feasted my eyes on the Caramel Apple Puff Pastry Pinwheels submitted by Southern Plate. I leaped into my car, in the most unladylike manner, and took off to the grocery store to get some Pepperidge Farms puff pastry. Upon my immediate return, I took out one of the two sheets of pastry so that it could thaw at room temperature, approximately 40 minutes. I wrapped up the second one and put it in my freezer for another day. I followed Southern Plate’s recipe except that I used butter instead of margarine, and made a cinnamon brown sugar glaze instead of a caramel topping. I also prepped my baking sheet with parchment paper instead of using cooking spray. Besides the obvious reason of using parchment paper to prevent your bakery from sticking, I like using it because you can slide your bakery off of the pan right onto a wire rack for cooling. Keeping it on the paper helps prevent it from falling through the wire rack, and removing it from the pan stops the bakery from cooking further. I started by preheating my oven to 375°F and lined a rimmed baking sheet with parchment paper. Set aside. Peel and dice 2 cups of apples. I had 2 large granny smith apples that measured slightly more than two cups. Chop 1 cup of pecans. 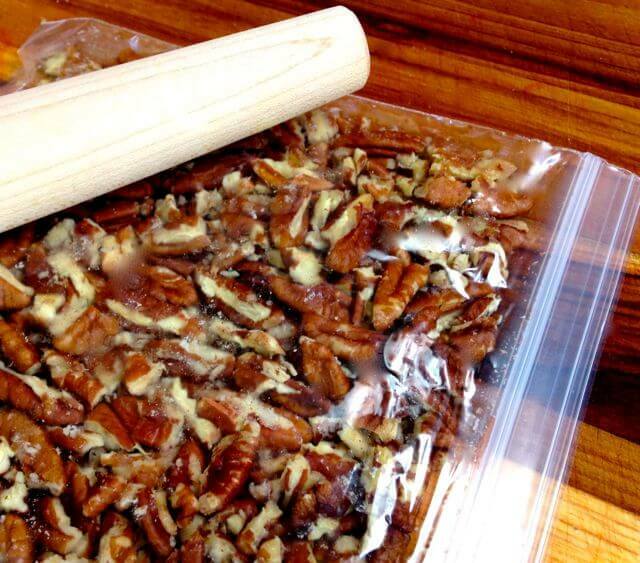 I put my pecans into a resealable bag and lightly pound them with my rolling pin. Go lightly so you don’t end up with pecan flour. 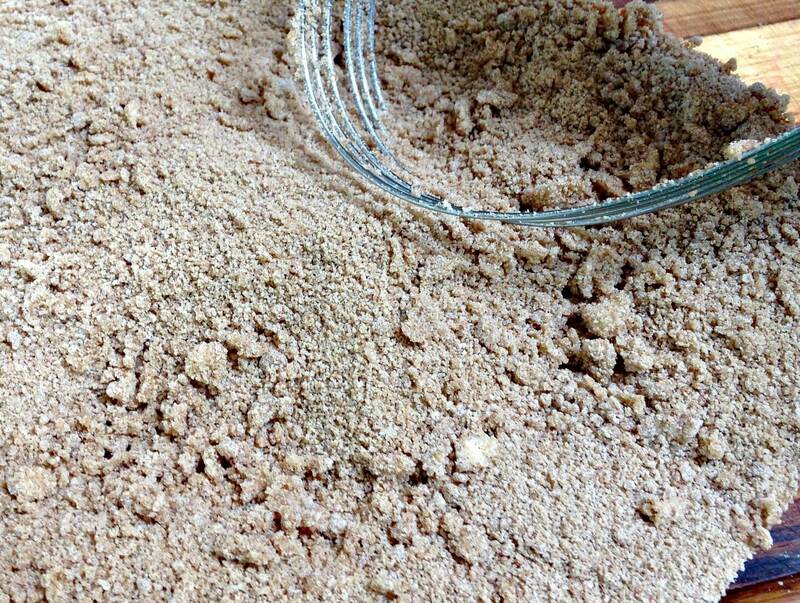 In a large bowl combine 1/2 cup all-purpose flour, 1 cup dark brown sugar, and 1 teaspoon ground cinnamon. Whisk or stir together and break up any large lumps. Cut in 1 tablespoon of diced cold butter until butter is small pea sized crumbs. Add apples and pecans to flour mixture and stir to combine. Roll out thawed sheet of puffed pastry until it measures approximately 15×10. I keep an 18″ plastic ruler with my kitchen gadgets for such purposes. Brush water lightly over top of pastry sheet. I used my fingertips. Pour apple filling into the center of the pastry sheet. Spread until it is an inch from the sides. Roll up jelly roll style or like a cinnamon roll. Cut into 1-inch slices. Use a sharp knife. I found that a slight sawing motion helped keep the rolls intact. Place on the parchment-lined baking sheet 2 inches apart. I got 12 rolls plus two little pigtails from the ends. Make sure you bake those too. Give them to your lover fresh out of the oven. They will think you are a culinary genius that can do no wrong. Bake at 375°F for 15 minutes or until slightly browned. Let the rolls cool about 5 minutes on the pan to set up. If any of the cinnamon goo seeps from the rolls, you can cut it away or leave them as is. Beauty is in the imperfection after all! Slide the rolls out on a wire rack by tipping the pan and pulling one end of the parchment paper over the rack just like a magician doing the tablecloth trick. While the rolls cool, prepare the cinnamon brown sugar glaze. In a small microwave-safe mixing bowl, combine 1 tablespoon butter, 2 tablespoons milk, and 1/4 cup brown sugar. Heat in the microwave for 15 to 20 seconds until melted. Add 1/4 cup powdered sugar, 1/2 teaspoon vanilla extract, and 1/4 teaspoon ground cinnamon to the melted mixture. Whisk together until sugar is completely dissolved. Add more powdered sugar if glaze is too thin or more milk if too thick. Dip a fork or whisk into the glaze and shake out over the rolls. (Or just pour it on, I’m not watching). Store in an airtight container. These make a great breakfast treat or a nice afternoon snack with a cup of tea. If you have one a day or two after you make them, put them in the microwave for a few seconds, and they come out bakery fresh. In a large mixing bowl, combine flour, brown sugar, and cinnamon. Stir together and break up any large lumps. Cut in butter to small pea size. Add chopped apples and pecans. Stir to combine. On a floured surface, unfold pastry sheet. Roll out until it is approximately 15×10. Brush pastry sheet lightly with water. 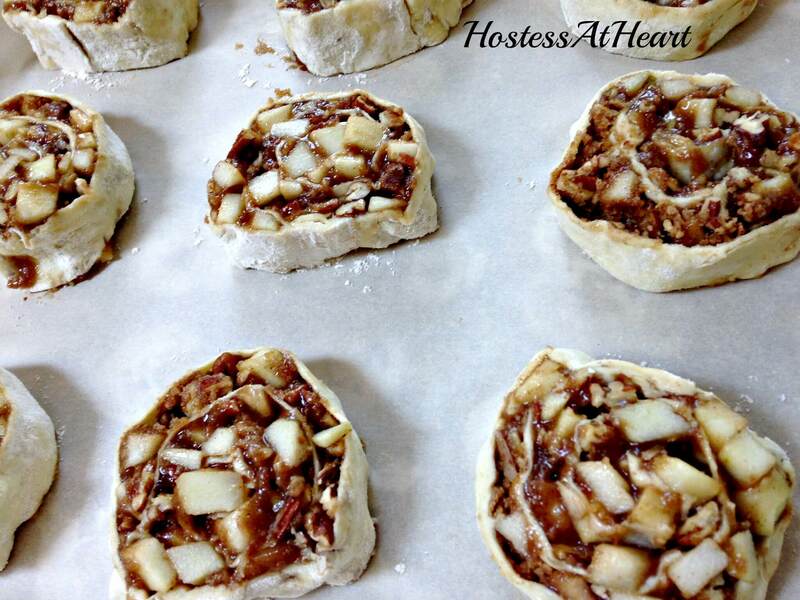 Place apple mixture into center of the pastry sheet and spread until it is an inch from the sides. Roll up jelly roll style. Cut into one-inch slices using a sharp knife and slight sawing motion. Place on baking sheet lined with parchment paper, two inches apart. Bake at 375 for 15 minutes or until lightly browned. Allow to cool on pan for 5 minutes and then pull bakery with parchment paper onto a wire rack to cook completely. 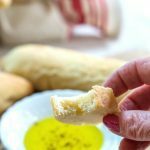 I have recently joined a group of bloggers who celebrate Fiesta Friday. 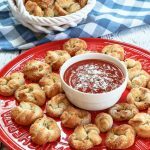 My friends response to this recipe has me thinking this would be a great addition to the next party! Head over there and see some other great submissions for yourself! Thank you! That is one of my favorite combinations too! Thank you for visiting. I had fun making this and it didn’t take long either. I would think you would get thrown out of Michigan if you didn’t like apples? Oh my, I am drooling alll over these!! I think I would have eaten them all before anyone else got a look in! Thank you so much Michelle! We could share one over that boozy peach milkshake! Sounds like a great plan to me! They look so good! 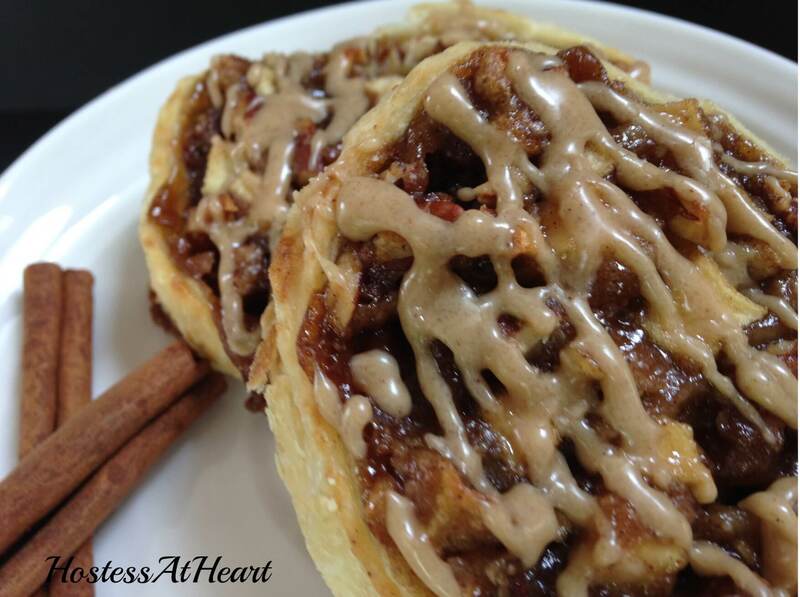 I love anything with cinnamon! Thank you for visiting! I love these flavors too. I think I would have found it a little hard to let 8 of these gorgeous pastries go… they look amazing! Such classic flavours that I absolutely adore. 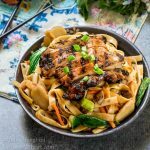 Thanks very much for bringing this recipe along to share at FF#28 – much appreciated! Thank you Margot. I knew those babies had to leave before the got to attached to my hips! Thank you for your kind comments! Oh you are so lucky to have your own tree! I love anything apples too! Thank you for visiting! I also can’t keep baked goods in the house, especially these pastries. They look far too good! Thank you for sharing these with Fiesta Friday, everyone will love them!! I know what you mean! Thank you so much for visiting! A little warming in the microwave and a cup of coffee and life is so good! Thank you Jess! Happy FF! What a beautiful dish! I love the look of the sugar glaze on top. Have a wonderful weekend, and happy FF! LOL! You sound like me. 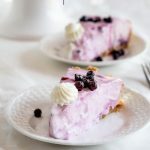 i love to make delicious desserts, but I immediately give most of it away. I can only indulge in moderation! These look amazing. Thank you so much! The were very good. I knew they had to disappear or I couldn’t hold myself accountable! These pastries sound so yummy! Thank you Nancy! They are dangerously yummy! This is so simple to make but so delicious and refreshing. I want to make some for myself! Thanks Liz! I hope you will and come back and let me know how they came out. Thank you Chitra! I appreciate your visit! Thank you so much Patti. They really came out good. Thank you! From you that is such a compliment! Thank you. They were very good. I would make you some! I wish we were closer too! Some of the links you will see on Hostess At Heart are affiliate links, meaning that, at no cost to you, I may earn a small commission if you click through and make a purchase.